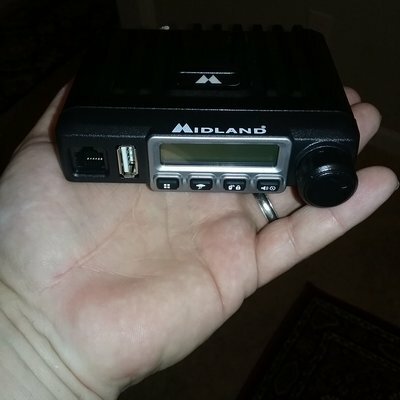 Just a heads up for those that are interested, MidlandUSA (makers of CBs, FRS and GMRS radios, weather radios and now Ham radios) is having a site-wide 20% off sale. The discount code is OVERLANDUSA. On a side note, their MicroMobile GMRS radios really are quite micro. Thanks for the headsup. that looks like a great size unit for jeeps. The only disadvantage is the license fee for GMRS is $70, but there is no exam and that license lasts for 10 years and covers your entire family. And when I say the entire family, the FCC states "Any individual who holds an individual license may allow his or her immediate family members to operate his or her GMRS station or stations. Immediate family members are the licensee's spouse, children, grandchildren, stepchildren, parents, grandparents, stepparents, brothers, sisters, aunts, uncles, nieces, nephews, and in-laws." Midland is now marketing a re-badged Anytone 2m/70cm radio. Now, i know we have discussed this many times, but why is FRS better than GMRS for what we do? You have that backwards. GMRS is high power FRS. Same frequencies, There are also Repeaters allowed on GMRS. So for $70 I can legally buy a license for one of these for 10 years and not need any exam? That is correct. And all of your family members listed above can legally operate on your license. I have my General license for ham radio, but I also have a GMRS license because it does fill that gap quite well. Many of the hams I know also have a GMRS license. That's one of the reasons that I recommended GMRS as an alternative to Amateur if people find the Technician exam intimidating. Also, the "bubble-pack" FRS radios can talk with these. So the Baofeng $25 cheapies are only UHV/VHF, which would not be covered by said license. Would the GMRS be better than CB for club use? started a new thread with some information I found on Midlands website.